More and more businesses want to improve their marketing or get into an inbound marketing because of the huge benefits it brings over traditional methods. However, some businesses aren’t quite ready to partner with us and transform their current sales and marketing activities. 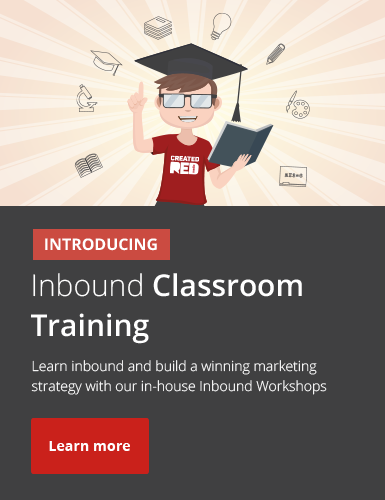 Others are looking to send employees or delegates on marketing training courses to learn inbound marketing and some simply want to explore inbound marketing and how it can work for them in the most cost and time-effective ways possible. That’s why we designed our online marketing training courses and interactive marketing webinars, to help educate businesses on the power of inbound marketing and train small teams or individuals in a small group setting how they can harness inbound to improve their current marketing habits. Why choose a marketing webinar or marketing training course? Having a simple search on the Internet will give you plenty of resources on inbound marketing, what it is and how you can use it. We even have a great intro guide you can download to get you started. However, reading flat materials is one thing, applying the theories in real life is another. You need to be able to ask questions, get feedback, and explore the best ways of improving your marketing that are specific to you. Our marketing training courses and marketing webinars are online versions of our inbound marketing workshops. Delivered by our HubSpot and Inbound certified team, we work with small groups of up to 15 people to deliver a complete intro to inbound marketing and how you can apply the methods to your very own business. What do your marketing training courses and marketing webinars cover? Designed for small groups of up to 15 delegates, our marketing training courses are delivered through online webinars. Each attendee simply joins the session and one of our inbound experts will lead the session. Questions are very much encouraged and specific help and advice will be provided in spades during each course. The aim of the webinars is to impart a detailed understanding of inbound marketing, help identify areas in your business that could be improved, and ultimately deliver a set of manageable marketing improvements start implementing right away.